Meg Keegan, a second-year Agriculture, Food and Environment and Water: Systems, Science and Society (WSSS) student, is incredibly modest in discussing her bravery and ingenuity while a student at the Friedman School. Aside from being a powerful voice in the classroom, a marathon runner, a student leader and researcher, Meg has already gotten a life’s worth of experience in one short year. 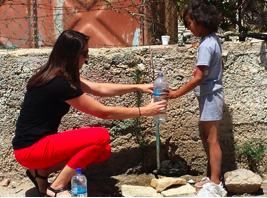 After traveling to a refugee camp Palestine with the WSSS program last March, Meg Keegan had no doubt in her mind that her Friedman internship would be with the same community. Meg’s internship, better described as a research project, was to investigate the food system issues in this very unique setting. She was awarded grant money from the Feinstein Center and Tufts University to finance the cost of her travels and planned the trip for the only time she could—August 7th, the end of Ramadan. The purpose of the trip was to look at the water-food nexus in the Aida Refugee Camp to determine the physical feasibility of household gardens and to estimate their ability to improve food security. Meg was providing the camp with an implementation tool for a household garden project supported by the Lajee Center in Aida. Meg learned first-hand how to survey food security and was the executive planner and manager of the project. Working with an excellent translator, Meg was able to carry out surveying and interact with a focus group. But her capabilities didn’t stop there: Meg’s drafting and industrial drawing skills enabled her to create schematics of the gardens she envisioned, providing the focus groups and camp residents with a more concrete tool for project implementation. However, during the project it became quite clear the bounds of her own abilities, as a student of agriculture she did not have the expertise to assist with engineering, hydrology, architecture or construction for the project, but she did have the patience and open-mindedness to allow experts in those fields share their talents. Overall, Meg’s experience was truly positive, and she suggests that anyone interested in this internship should take Jenny Coates’s NUTR 304 course on Nutrition, Food Security, and Development and to get involved with the Feinstein Center. Meg notes that there is a balance necessary to succeed well in Aida with the Lajee Center: proposed projects or research must be preconceived, clear, and well-planned, but also in line with the needs of the community and the objectives of the Lajee Center. Amy Elvidge is a second-year AFE student and one of the current co-editors of The Friedman Sprout.